Happiness is the outrageously corrupt state of Montana in the rearview mirror. Bill Windsor is a happy camper, at least as happy as one can be while facing the potential of life in prison for Tweeting, when you didn't even Tweet. 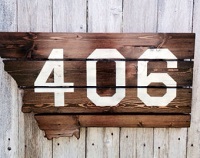 To illustrate how small Montana is, everyone in Montana has the same area code: 406. Billboards and ads don't show the area code. It's like it was back in the 50's. When I am asked for my phone number in a store, it always gets screwed up as clerks assume 406 is your area code. Not mine! I've been out of the hoosegow for 48 days. Despite being sick for over half that time, it has been very productive. I'm not dizzy if I sit and stare at a keyboard, which is what us two-finger typists have to do. I probably emptied and trashed five Bankers Boxes of mail and court documents after I scanned my little heart out. As I prepare for the possibility of life in prison and a virtual complete loss of Constitutional rights, I needed to be sure someone could find my documents, print them, and mail them to me. So, I scanned and scanned and scanned. And I have a new toy called Directory Print and List. It enables me to print a nice, neat list of all the files in the folders on my hard drive. So, I'm printing those and stuffing them in an envelope that can be mailed to me should I again be incarcerated. I can simply tell a helper which files to print. So, the load in my vehicle is much lighter as I head South. I wish I had a dollar for very time I've bought a cooler in my life. I figured a $19.99 investment in a Playmate was better than seeing the condiments in the motel refrigerator go to waste. Plus, I can keep my water cold as I mojigate down the two-lane roads. It was 98 in Missoula today. Long pants are getting very old. I may just have to start wearing my shorts and live with people staring at my right ankle. I wore long pants only one of about 365 days on the road filming. I want to say a big THANK YOU to Kayla, Taryn, Amber, Megan, Alic, and Casey. They know who they are and what they have done for me! THANK YOU! You are THE BEST! And no, I am not going on trial for murder. It seems that some of my personal property disappeared when the Meridian Idaho Police Department illegally seized and searched the vehicle that I parked at the AT&T Store 10 minutes before armed police officers with Tasers drawn grabbed me on February 19, 2015. One of my cellphones and some electronic equipment is missing. If you haven't read this article, please do: Will Kellie McDougald of Kemp Texas be prosecuted for Perjury? I'm going to try to get someone to transcribe the 40-minute interview that incompetent and/or corrupt Missoula Police Department Detective Chris Shermer had with Sean Boushie and Wynette Boushie. What a sick liar this guy is. And that one September 2013 conversation appears to be the total investigation done into my alleged 2014 crimes. No investigation. No evidence. Nothing but corrupt and/or incompetent people.